1) March 19, 2010: The simple purity of Lapageria alba and praise for the Chilean climbers which are almost never without a flower for us. 2) March 19, 2010: Outdoor Classroom on lifting and limbing – aka: a little bit of judicious pruning can make a significant difference. 3) March 19, 2010: In the Taranaki garden this week : With autumn approaching rapidly, we offer advice on garden tasks for the week ahead, including our usual plug for green crops and compost, along with advice on using animal manures. We have recently started a little collection of birds’ nests here and Mark is regretting that he did not start recording his observations years ago so he could chart the changing materials our feathered garden inhabitants have used over the years. While we try and minimise litter here, it is frankly alarming to see the number of Tuflok labels, plastic ties and budding strips that the birds find to line their nests. They are also stripping the threads of fibreglass from a clear roof here. I was particularly taken by the little chaffinch nest constructed from dried grass and lichen and lined in what looks like dog fur (I did trim our long haired sheltie for summer) but which Mark disappointed me by telling me was in fact the fibrous thread from our tree ferns (pongas). We have been bringing in the abandoned nests we find in good condition and arraying them under cover up the vinous stems of Tecomanthe venusta. 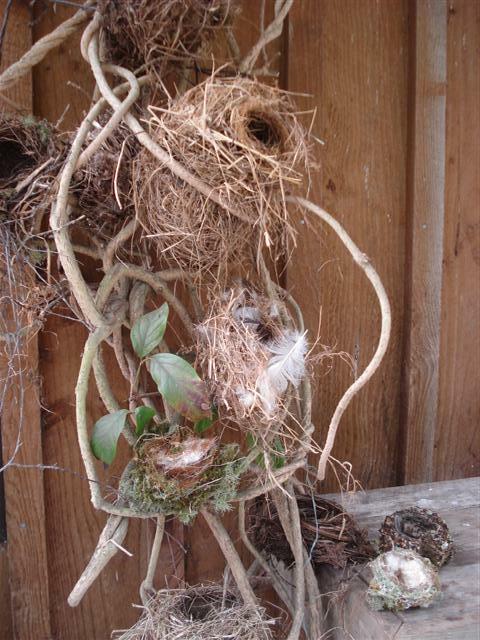 This entry was posted in Tikorangi notes and tagged Abbie Jury, birds' nests, lapageria alba, pruning trees, Tikorangi: The Jury garden on 19 March 2010 by Abbie Jury.